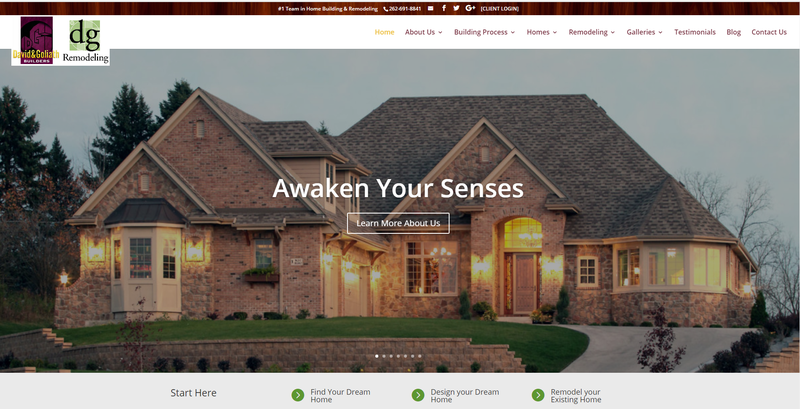 Black Raven Media, LLC is proud to announce the launch of a new website for their client David & Goliath Builders and DG Remodeling. This comprehensive site offers an array of information to assist in designing a custom home or remodeling an existing home. David & Goliath uses the REVIT BIM 3-Dimensional drawing program – one in only a handful of builders in Southeastern Wisconsin to do so. This allows clients to use state-of-the-art technology to feel as if they are walking through their home even before they break ground. This computer system also enables the client and designer to experience open communication and make instant changes in the floor plan. This program will ensure that the ideas in a client’s imagination can be recreated in the design of their home. The new website is filled with photos and important information to give potential customers a complete understanding of the building process. There is also a plethora of floor plans, home designs, interior and exterior finishes, and before and after photos. This offers the user a stellar online experience. Current and potential customers are just a click away from the home of their dreams. This new website also provides easy access to online blogs with product comparisons, industry news, design trends, and more. Topics such as window condensation, advantages of a custom home, and remodeling projects have been recently covered. Based in Milwaukee, Wisconsin, Black Raven Media, LLC is best known for the success they have brought to the home improvement, home building, and remodeling industries. This digital agency is also the producer of Builders Showcase – the well-branded television show to assist future homeowners in choosing a builder and a home design. The agency specializes in Search Engine Optimization (SEO) campaigns, PPC, website design, and creates design branding, interactive web solutions, and content marketing. The company boosts online exposure and increases social networks, builds award-winning and multi-platform applications, and creates websites. Your company will rise above all others when you work with Black Raven Media. In addition, Black Raven Media is the parent company of Builders Showcase Television, the Builders Showcase Magazine, and Builders Showcase 360 Digital. Debra Lopez Public Relations, LLC is an associated Milwaukee-based Digital Agency and Public Relations Firm focused on the development and implementation of company publicity and brand awareness, search engine optimization, advertising campaigns, and social media. As one of Milwaukee’s premier homebuilders, David & Goliath has been building new homes and remodeling existing homes since 1985. They have award-winning carpenters, masons, interior designers, landscape experts, and of course, architectural designers. With more than 500 homes built or remodeled, David & Goliath Builders’ combination of personal attention and years of experience earn their clients’ trust during the building process and when the project is finished, provides lasting value and enjoyment for years to come.